Melody Makers is an exciting, energetic and determined local company that creates fun and exciting music projects, collaborative workshops and performance events in schools and community arts venues across the region and employs some of the most talented professional freelance musicians and creative artists from the local area. "Music belongs to everyone....music is a spiritual food for which there is no substitute....There is no complete spiritual life without music, for the human soul has regions which can only be illuminated by music". 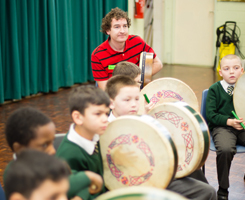 In 2014 we recieved private funding from Cargo marketing services to provide a summer holiday music camp for children in the local area teaching celtic music, dance, art and drama. It was a week long and at the end of the week we performed a concert for the local community. Please see the gallery page for the photos! This year we have secured funding from the BIG Lottery to provide instrumental tuition workshops for the violin and tin whistle. Classes are in held in Melrose Hall every Wednesday for the local community of all ages and abilities.